of reasonably prominent characters from that decade. Mr. Monster, who first appeared in 1984, is of that sub-genre, but the hero he's based on was never the least bit prominent. In fact, if cartoonist Michael T. Gilbert (Elric of Melnibone, The Wraith) hadn't taken an interest in him, and based his loud, flamboyant, over-the-top, monster-hating superhero on Jim "Doc" Stearne, aka Mr. Monster, practically nobody would ever have heard of the '40s version. He'd be as obscure as Bozo the Robot, Speed Centaur and Wiggles the Wonderworm all rolled into one. The original Doc Stearne was a two-fisted adventurer along the lines of pulp hero Doc Savage, of whom he may have been intended as a knock-off. He was created by cartoonist Fred Kelly, whose other known credits are somewhere between sparse and nonexistent. Kelly did him for a small, virtually unremembered Canadian publisher called Bell Features (probably not related to Bell Syndicate, distributor of Mutt & Jeff, Don Winslow of the Navy and more). Doc was one of the lesser lights even among Bell's heroes, who included Captain Wonder, The Black Avenger and Nelvana of the Northern Lights. In Bell's Triumph Comics #31 (April, 1946), Doc (so called because he was a psychiatrist in his day job) became interested in monsters, and quickly acquired "Mr. Monster" as a nickname. When he decided to put on a superhero suit, that was the name he chose. As Mr. Monster, he is known to have had one adventure, in Super Duper Comics #3 (June, 1947); and it's strongly believed that was the only one, at least for the next few decades. When Gilbert was asked to contribute to Vanguard Illustrated, the apparent purpose of which was to develop new properties for Pacific Comics (Captain Victory, Starslayer) to exploit, he drew on Kelly's character as inspiration. The first new Mr. Monster story appeared in the seventh issue, which came out in 1984 without a specific cover date. Gilbert's version was a fanatical monster hater, extreme not only in his attitude, but in his design and in every move he made. The "Mr. Monster" persona was modified away from a mere costume and nickname adopted by Jim Stearne (re-spelled "Stearn" in the new incaranation). Under Gilbert, it was a hereditary position, going back to antiquity and now held by Jim's son, Strongfort. Being Mr. Monster was not only the driving force of Strongfort "Doc" Stearn's life — it was his inevitable, irrestible destiny. Assisted by his "girl Friday" (Kelly Friday, first name chosen to honor the original's creator), Mr. Monster would sally forth from his mountaintop citadel to do mighty battle with vampires, werewolves and things that go bump in the night, all over the world. As seriously as he took his mission, however, he himself was not taken entirely seriously by Gilbert. 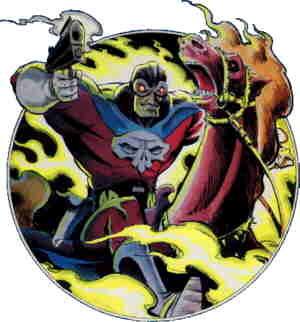 Pacific Comics didn't use Mr. Monster after the one Vanguard appearance, but other publishers of creator-owned material did. During the next couple of decades, he was published by Atomeka Press (Zombie Tales), Caliber Comics (The Crow), Dark Horse Comics (The American), Eclipse Enterprises (Ms. Tree), Fantagraphics Books (Usagi Yojimbo), Image Comics (Spawn) and Tundra Publications (Teenage Mutant Ninja Turtles). Also, he played the "cryptkeeper" role, introducing stories reprinted from the '50s by Eclipse, under the common rubric Mr. Monster Super-Duper Special, with themes such as "Mr. Monster's Hi-Octane Horror" and "Mr. Monster's True Crime". Currently, he's introducing articles on comics history in the fanzine Alter Ego. The longest and most serious Mr. Monster story to date is "Origins", originally published as an 8-issue mini-series by Dark Horse, 1988-91, and later re-worked into a graphic novel for Graphitti Designs (Madman). It explored the relationship between the current Doc and his father. But it wasn't entirely devoid of the tongue-in-cheek approach that characterizes all of Gilbert's Mr. Monster stories. Mr. Monster has never had a major motion picture, a prime-time TV series, or even a Saturday morning cartoon. But in comic books, the occasional new Mr. Monster story is always a welcome sight to the many fans he's garnered over the years. Text ©2006-10 Donald D. Markstein. Art © Michael T. Gilbert.